Presair’s pneumatic foot pedals are a great solution for turning drain cleaning machines on/off. Typically drain cleaners are found in wet, hazardous environments. Using an air operated foot switch, the user isolates them self from the electrical current because there is zero voltage at the point of actuation. 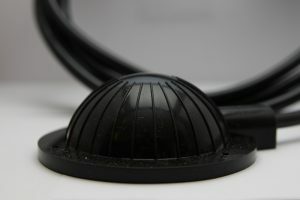 The foot pedal connects to an air switch using the desired distance of air tubing. When the foot pedal is depressed a pulse of air is sent through the tubing actuating the air switch, which in turn safely operates the equipment. Because the system uses a maintained air switch, as soon as the operators foot leaves the foot pedal the sewer cleaning machine turns off. The foot switch provides convenient power switching to the operator while creating a safe environment. Our F800 series foot pedal, shown above, is commonly found as a direct replacement for many sewer cleaners such as Ridgid, Cobra and Spartan. Although, our B621 and B721 hard foot pedal series contain an internal bellow that is secured within a protective housing, making this option ideal for the tough environments. For the a direct replacement air switch, please purchase catalog number TNM425A/10117. A direct replacement foot pedal, please purchase catalog number F800BM-5. 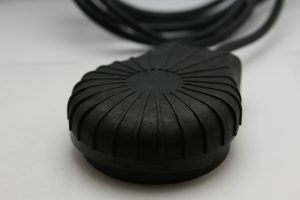 For more information regarding the drain cleaner foot pedal switch visit the Drain Cleaning Forum. Both foot pedal models are available for purchase online, or contact us to purchase the complete assembly – foot pedal and air switch.